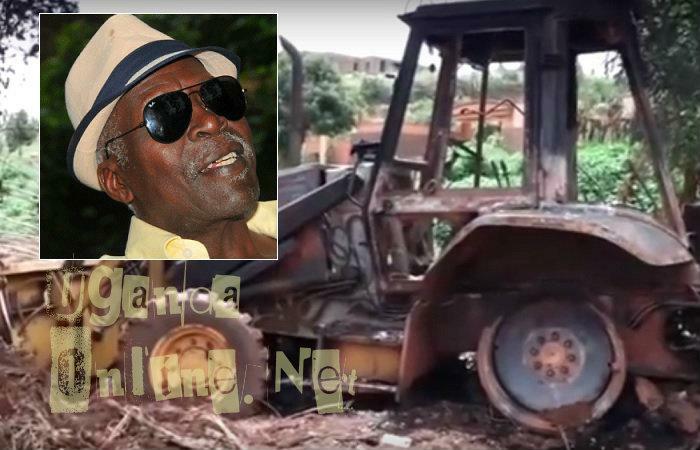 The grader that was set ablaze was hired to level part of the land located in Lweza off Entebbe Kampala Highway. Gwanga says the land belongs to his wife who is abroad and he has the land title to the said land. He was tipped by the people he allowed to temporarily use the land that there was some activity going on at the site. He grabbed his gun and came to the site, he first shot some few rounds in the air dispersing those who were around including the driver, he then grabbed a jerrycan of fuel which he poured on the grader before setting it ablaze. 1. Did the grader owner look at the land title for the land he was working on? 2. I'm aware of two groups that are claiming this land, they claim to be royals, could they be part of the group that contracted the grader driver to do the job? Let him come and explain. "It's true I burnt the tractor, so let the owner of the land together with the driver come up." Kasirye Gwanga added. Meanwhile, it's only the grader owner who has reported the matter to police, the driver and those who claim to be the owners of the land are yet to appear at the police to also make statements.